There is no doubt that football is an interesting game. Over the years, the NFL has produced lots of talented, smart, and heroic players who have successfully secured a spot for themselves in the history of the leather oval game. 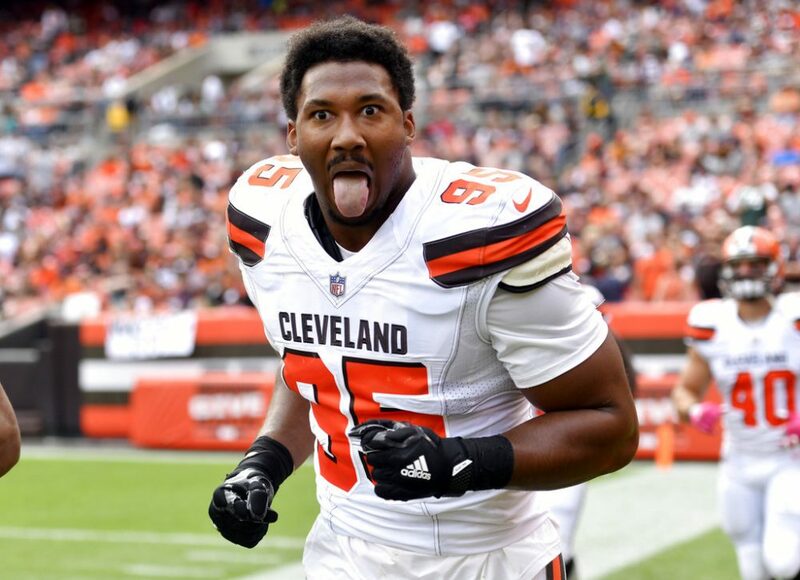 Interestingly, Myles Garrett stands out as one football star to watch out for – he is literally stuffed to the brim and has so much to offer to the world of football. Before committing fully to football, Garrett banded together with his high school’s track and basketball teams. In track and field, he holds the record as a state qualifier in the throwing events, having gained an impressive 50.84 meters in the discus throw and 16.01 meters in the shot put. Let’s get to know more about this fast-rising NFL player. The NFL defensive end player was born to Audrey Garrett and Lawrence Garrett on the 29th of December 1995. Born as Myles Lorenz Garrett, the talented footballer currently represents the Cleveland Browns in the National Football League (NFL). Being the last child of his parents, Myles has two older siblings named Sean Williams and Brea Garrett. The former is 10 years older than him and doubles as the first son of his mother, who came from a previous relationship. Brea is Myles’s biological sister. His mother Audrey got married to Lawrence when Sean was five years old. Not long after their marriage, Brea and Myles were born. The Cleveland Browns defensive end owes his high school education to Martin High School, Arlington, Texas, where he participated in track, basketball, and football. Myles’s college career lasted from 2014 to 2016 at Texas A&M. While his stint at Martin High lasted, he recorded 19.5 sacks in football as a senior and was also ranked as the second best overall player in his class. In his junior year at college, the NFL player gained a pass breakup, 32 total tackles (with 18 solo), 8.5 sacks, 15.0 tackles for loss, two forced fumbles, as well as 10 quarterback hurries. That season alone earned him a Unanimous Consensus All-American designation and then a spot with the first-team. This was made possible after The Sporting News, the Football Writers Association of America, the Walter Camp Football Foundation, Fox Sports, SB Nation, the Associated Press, Pro Football Focus, and the American Football Coaches Association gave him their support. Born into a family with a rich sports history, it’ was only natural that he toed the line of sports. His mother, Audrey, was a track and field star during her active years at Hampton University in Virginia. She joined Hampton’s track team on a scholarship and holds the record as an All-American hurdler in the 60-meter event, a feat she achieved in the year 1982. She graduated from the university with a degree in communications. Similarly, Myles’s older sister is already a track and field star. Brea rose to immense popularity due to her brilliant performances on track at Texas A&M as a junior and for winning the 100 hurdles as a senior in Martin High School as well as the Class 5A titles in the shot. In 2014, she emerged the winner of the indoor NCAA championship in the weight throwback and doubles as the first weight throw champion in Aggie history. Brea was also part of the team that trained to represent the USA at the 2016 Summer Olympic Games in Rio de Janeiro. His older brother, Sean Williams, started playing organized football at the age of 15 and was first team all-region in his senior year at Mansfield High School. He had his college football career at Boston College, where he made history for most blocks in a game (13) and also in a season (75 in 15 games). Sean was, however, dismissed from the college’s football team for violating the rules on marijuana. Before then, he was suspended twice and was even arrested for possessing marijuana. These troubles shook his career roughly and impacted on his relationship with his mother. Besides football, Williams is a basketball star as well. After ending his stint with Boston College basketball team, he went on to represent the New Jersey Nets in the National Basketball league from 2007 to 2012 after he was selected by the team in the round of the 2007 NBA Draft. Despite his battle with marijuana and love for football and basketball, Myles Garrett still considers his older brother as his mentor and role model. Following a successful junior year at Texas A&M, Myles Garrett opted to enter the 2017 NFL Draft. He was later selected with the first overall pick in the first round of the 2017 NFL Draft by the Cleveland Browns. Both parties would sign a four-year deal worth $30.41 million on May 19, 2017. The contract reportedly came with a fifth-year option, $20.25 million signing bonus as well as offset language options. Garrett made his debut appearance for the Browns on October 8, 2017, in a game against the New York Jets after missing the first four games of the season due to a high ankle sprain that occurred during practice on September 7, 2017. He ended the season with 1 pass defensed, 28 combined tackles (16 solo), 1 fumble recovery, as well as 7 sacks, finishing first on the Cleveland Browns in sacks, having played 10 of 16 games due to injuries. Recently, Myles Garrett was unveiled as a defensive captain for the 2018 season game. His career highlights and awards are detailed as follows: Second-team All-SEC (2014), Bill Willis Award (2015), PFWA All-Rookie Team (2017), 2× First-team All-SEC (2015, 2016), and 2× First-team All-American (2015, 2016). Is Myles Garrett Dating? Who’s His Girlfriend? The 6 feet 4 inches hunk has been linked to a lady simply identified as Gabby. According to sources, the two have been together for some time and are showing no sign of breaking up. However, it is not known how long they’ve been together but Gabby is one amazing fellow who has been very supportive of her boyfriend’s thriving career.